Adverse drug event (ADE) "injury resulting from medical intervention related to a drug" (Kohn, Corrigan, Donaldson 2000). Adverse drug reaction (ADR) "harms directly caused by a drug at normal doses"
"ADEs account for nearly 700,000 emergency department visits and 100,000 hospitalizations each year. (PSNET 2015). Medication error is a term that assigns blame and presumes wrongdoing. In a culture of safety, shame and blame are no longer the preferred institutional response to patient harm. The preferred response is systemic change that reduces the possibility of similar events. The term "adverse drug event" (ADE) is preferred over "medication error" because it is patient centered. Rather than blaming one healthcare provider, it focuses attention upon actual harm experienced by a patient within a healthcare setting. Nursing deserves tremendous credit for its success in limiting ADEs. In spite of chronic understaffing and minimal technological support, nursing has protected the patient. A study by Bates, Boyle, Vander (1995) determined that nurses intercepted about half of all preventable ADEs prior to drug administration. Have a pharmacist available on call for consultation after normal pharmacy hours. Employ special procedures and written protocols for the use of high-risk IV and oral medications. Take all the time necessary to thoroughly understand your patient's diagnoses and the side-effects common to the drug treatments for those ailments. Use your resources; the pharmacy is your ally; consult with them. Identify an "on-site consultant" to lead intervention when an ADE occurs. Demand real-time access to current nursing, medical and pharmaceutical references and use them to improve care. Consider carrying a handheld medication reference with drug indications, doses, routes, interactions, and other considerations. Demand the time and support necessary to master drug administration devices common to your work setting. Promote practice drills to identify and reinforce appropriate staff response to ADEs. Document and clarify any confusing orders with the prescriber. Confirm any order, or dispensing circumstance, that is unusual with pharmacy. Encourage adoption of Point of Care electronic charting and computerized physician order entry with decision support. Transcribe orders in printed block letters. Verify every order which contains an abbreviation on the the Joint Commission "Do Not Use" list. DO precede a decimal point with a numeral; e.g., 0.5 mg "Do Not Use" list. Notify pharmacy and "Incident report" any circumstance that could lead to "Look-alike, Sound-alike" confusion. Don't rely on memory; document each drug administration as soon as possible. Verify the completeness and accuracy of patient information as the patient enters and transitions through the medical system. Incomplete information is responsible for about 50% of errors and 20% of pADEs. "Incident report" every near-miss as well as ADEs that cause harm. Organizations can't improve without information. Identify your patient using multiple identifiers. Assess your patient for contraindications to each medication. Patient centered education so that your patient expects announcement of the drug name, dose, purpose and the next scheduled dose before each administration of a medication. 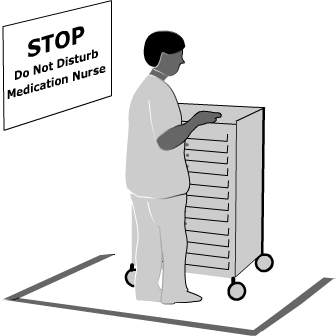 Some hospitals employ a No Interruption Zone (NIZ) around nurses while preparing and administrating medications. These zones are made visible by cordoning off a quiet area and donning colored vests or other specially designated clothing. Do Not Disturb signage can useful. No interruption also applies to mobile devises which should have calls transferred to staff that not are not actively dispensing medications. Staff should be educated to avoid interrupting nurses that are preparing or administering medications and physicians writing orders. Only during significant changes in a patient’s condition, when no one else is available, should someone involved in the ordering, preparing or administrating of medications be interrupted (Wiencek, Bauer, Daly, Anthony, 2010). Neonate/Infant body mass, smaller plasma volume, and inefficient liver and kidney clearance, compared to older children and adults, tend to make drug and dose errors significantly more serious. Reiter (2002) succinctly expresses the issue with: "The neonate is in a rapid and continuous state of maturation, which can influence significantly the therapeutic and toxic effects of drug therapy." Geriatric patients often require daily medications, both OTC and prescribed, to manage multiple diagnoses. Ensuring continuation of necessary medications after an intervention is an important aspect of safe care. The more complex the medication regimen, the greater the chance of interactions and side-effects. Alterations in drug absorption and clearance must be anticipated in even the healthy elderly. Critical Care (High-Risk OB, ER, OR, ICU) environments are known to have the greatest risk of serious adverse drug events and outcomes. These practice areas require the highest level of vigilance and the lowest tolerance for deviations from policy. Nebeker JR, Barach P, Samore MH. Clarifying adverse drug events: a clinician's guide to terminology, documentation, and reporting. Ann Intern Med. 2004;140:795-801. Weiss A, Elixhauser A, Bae J, Encinosa W. Statistical Brief #158. Healthcare Cost and Utilization Project (HCUP). September 2013. Agency for Healthcare Research and Quality, Rockville, MD. www.hcup-us.ahrq.gov/reports/statbriefs/sb158.jsp. Bates D, Boyle D, Vander Vilet M, Schneider J, Leape L. Relationship between medication errors and adverse drug events. Journal General Internal Medicine. 1995 Apr;10(4):199-205. Reiter, P. (2002) Neonatal Pharmacology and Pharmacokinetics. NeoReviews Vol.3 No.11 p. 229. Lucado, J. (Social & Scientific Systems, Inc.), Paez, K. (Social & Scientific Systems, Inc.), and Elixhauser A. (AHRQ). Medication-Related Adverse Outcomes in U.S. Hospitals and Emergency Departments, 2008. HCUP Statistical Brief #109. April 2011. Agency for Healthcare Research and Quality, Rockville, MD. Available from: http://www.hcup- us.ahrq.gov/reports/statbriefs/sb109.pdf.